The Wilton Historical Society is delighted that the “Best Whimsical Design” at the Wilton Library ‘s How Sweet It Is contest went to the “Railroad Station” which also won Community Pick. “English-speakers, and particularly children, began spinning whirligigs as early as the 15th century. “Thomas Jefferson once referred to George Washington as “the best horseman of his age, and the most graceful figure that could be seen on horseback. Happy 4th of July! Did you know? Most Americans are familiar with the Yankee Doodle tune, and can recite some of its familiar verses, but few are aware that the song was originally adopted in this country during the French and Indian War in 1755. 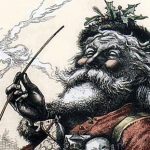 “Most people do not associate Santa Claus with war, but in fact the connection goes back to Santa’s very beginnings.